Feel like you can't make a difference? “Multiply is a simple, practical, biblical, helpful, and personal tool for disciples of Jesus who want to make disciples of Jesus.” So says foreword writer, David Platt, pastor of the 4,000+ Brook Hills Church in Birmingham, Alabama and its world wide mission. In this return to the heart of what it means to ‘follow Jesus’, Francis Chan, pastor of Cornerstone Church, Simi Valley, encourages you in your responsibility to make disciples, and sets about equipping you for the great adventure that is one-to-one evangelism. Answering the call to ‘Go into all the world and make disciples’, Chan starts right at the beginning with the question: ‘If being a disciple of Jesus is as simple as obeying the call to follow, why don’t we follow?’ The answer they give explains that the answer is as simple as the question: we start here – ‘with one person. One-to-one discipleship — multiplying the Gospel just as Jesus did’. 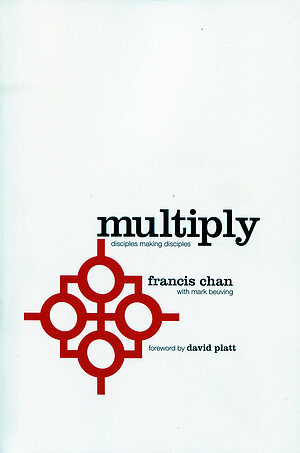 ‘Multiply’ is a vision, a response and tool kit for discipleship. It’s the vision of God’s people across the country moving back to the disciple-making that Jesus taught. It’s the response to that movement of God. It’s a toolkit for answering important questions, for spreading the Gospel and for watching as God multiplies divine saving grace one person at a time. Successful church pastor and best-selling author Francis Chan (writer of ‘Crazy Love’, ‘Forgotten God’ and ‘Erasing Hell’) examines how can we obey God’s biggest command - to go and make disciples, and what it means to return to Jesus’ simple concept of one-to-one discipleship. ‘Multiply’ is different. It’s not a small-group programme or a big church Bible study. It’s simply the Gospel for everyone. It’s about how you as one of God’s people share your experience of life – of walking through God’s amazing story of redemption – and bring one other into that same experience of God and walk along the same road with you and with God. 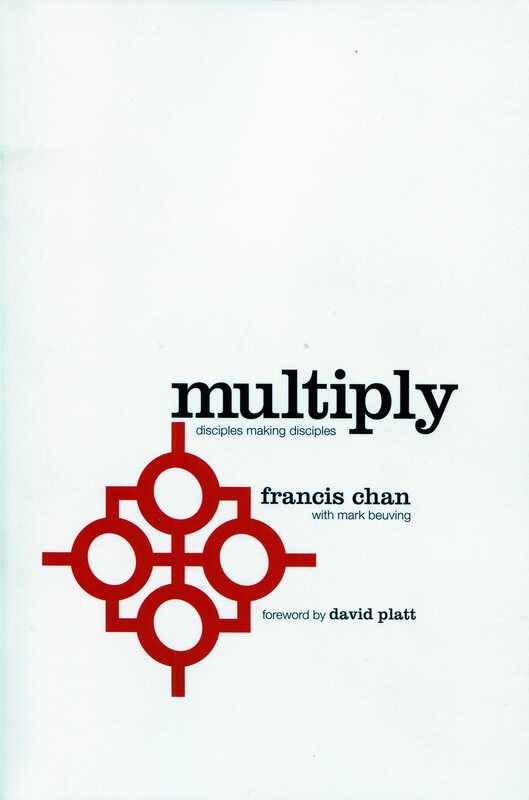 Multiply by Francis/Beuving, Mark Chan was published by David C Cook in October 2012 and is our 11915th best seller. The ISBN for Multiply is 9780781408233. Be the first to review Multiply! Got a question? No problem! Just click here to ask us about Multiply. Jesus Christ handpicked common, uneducated men to build His church (Acts 4:13). Several were fishermen. One was a tax collector. All of them could be labeled 'ordinary.' Yet under their leadership, the church flourished while the world stood amazed. Today, the church looks to 'trained professionals' to do the work. Lay people who have tremendous potential are made to feel inadequate by the religious elite. Many are paralyzed, believing that they 'don't know enough' to be of much help. So they sit silently in church services and watch the educated minister. This was never God's intention. Jesus gave his followers a command: "Follow me". And a promise:"I will equip you to find others to follow me." We were made to make disciples. Designed for used in discipleship relationships and other focused settings, multiply will equip you to carry out Jesus' ministry. Each of the twenty four sessions in the book corresponds to an on-line video (www.multiplymovement.com) where New York Times bestselling author, David Platt, joins Francis Chan in guiding you through each part of Multiply. 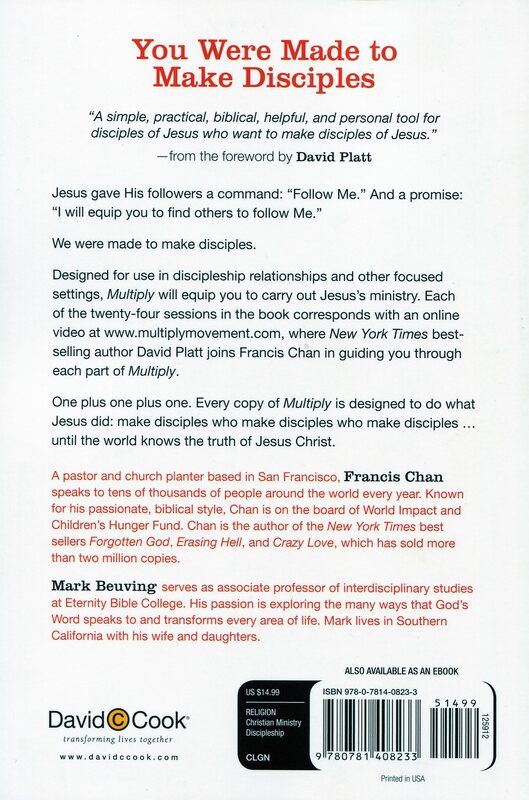 On plus one plus one... Every copy of Multiply is deigned to do what Jesus did: make disciples who make disciples who make disciples- until the world knows the truth of Jesus Christ. Francis Chan: A lot of people have memorised this passage, but are they doing it, is it actually happening? We’re all afraid - have insecurities. Can we work together to get rid of those and pray that God gives us power over those things, and then actually observe, actually go and do what he commanded us to do? David Platt: So the heart behind multiply is to help us remember and remind each other: “Hey, we’re disciples of Jesus. That means we make disciples of Jesus.” This is not just for the super-gifted, the super-talented. David Platt: The heart behind Multiply is saying: “How can we encourage every single follower of Christ to fish for men Every Single disciple of Jesus to make disciples of Jesus and then along the way equip one another, help give one another tools that can help in the process.” So that you and I can together accomplish the greatest mission on the planet: seeing disciples made among every nation among every single people group. Francis Chan begins by pointing out that the disciples could not have fully understood what they were getting into when they responded to Jesus’ call. But everything about Jesus - his teaching, compassion, wisdom, life, death, and resurrection, power and authority, would shape every aspect of the rest of their lives. The first part of ‘Multiply’ gives simple answers to big questions that we need to get sorted before we start making disciples of others. For one thing, what is a disciple? The word disciple simply means a student or apprentice. Disciples in Jesus’ time would follow their rabbi (which means teacher) wherever he went, learning from the rabbi’s teaching and being trained to do as the rabbi did. Basically, a disciple is a follower, but only if we take the term follower literally. Becoming a disciple of Jesus is as simple as obeying his call to follow him where he leads. The first picture Chan gives of the steps in becoming a disciple is based not in the New but in the Old Testament. Moses warned Pharaoh repeatedly about what God would do if he did not repent and let the Israelites go free. And he told his own people if they put the blood of a lamb over their doorposts, they’d avoid the punishment God had in store for their captors. The story shows how people had to trust in the ‘blood of a lamb’ to save them as the only way they could be saved. Disciples of Jesus need to have the same trust, insists Chan. From here, Chan moves on to introduce the concept of Salvation as all about the grace of God. As there is absolutely nothing that we can do to save ourselves or earn God’s favour, salvation comes through the grace of God by our faith in Jesus Christ. It All Comes Down To Love, he says getting to the point of the first part of Multiply that following Jesus is not about diligently keeping a set of rules or conjuring up the moral fortitude to lead good lives. It’s about loving God and enjoying Him. These simple truths will be unpacked in far greater detail in Parts III and IV: “Understanding the Old Testament” and “Understanding the New Testament.” The full significance of these truths will be explained then, but the truths themselves are important to understand from the outset. Each of the 24 sessions includes a number of questions that will challenge the way you to think about the material covered. Chan stresses that in one-to-one disciple making, knowledge isn’t the point. The aim is to start a discussion – the more you can make your discussion practical and applicable to the life of a new follower of Christ, the better. Jesus’ command to make disciples in the Great Commission (Matt 28:18-20) was not intended solely for the early disciples, nor is disciple-making the responsibility of a special class of Christians. Rather, all followers of Christ are called to make disciples, to fish for men (Matthew 4:19). Many don’t actively make disciples because they don’t know what it means to be a disciple. On a practical level discipleship means that we look at other people and say exactly what Jesus said to his disciples: “Follow me.” To make disciples is to intentionally show the life of Christ before others, to share the gospel of Christ with others, to teach the Word of Christ to others, and to do all of this with a view toward reaching every people group in the world with the gospel. The ‘Multiply’ vision is to instil local churches with a desire to win disciples by emphasizing this glorious and much-neglected aspect of our calling as followers of Christ. Multiply aims to encourage individual Christians unaware of their biblical responsibility to make disciples, and to equip them to do it – even though many might not know how to take the first steps in making disciples. The creators of ‘Multiply’ aim to help individuals make disciples by providing resources and materials for those seeking to learn from God’s Word with the intent to disciple others. The ‘Multiply’ resource is a 24-session discipleship experience where one person learns how to help another understand what it means to follow Jesus, to study scripture, and to be ‘the church of Christ’. Most of all, the vision of ‘Multiply’ – as a movement and a resource is to equip and encourage followers of Christ, in their local churches and homes, to encourage one another in the disciple-making process. Dr. David Platt, Pastor at The Church at Brook Hills, is deeply devoted to Christ and His Word. David’s first love in ministry is disciple-making – the simple, biblical model of teaching God’s Word, mentoring others, and sharing faith. He has traveled extensively to teach the Bible alongside church leaders throughout the United States and around the world. He has authored two books, Radical – Taking Back Your Faith From the American Dream, and Radical Together – Unleashing the People of God for the Purpose of God. He is the founder of Radical, a resource ministry, dedicated to serving the church in making disciples of all nations. David and his wife, Heather, have three children – Caleb, Joshua, and Mara Ruth. They are expecting their fourth child, Isaiah. Multiply is everyone who dreads the idea of personal evangelism and one to one discipleship, but knows that this is the responsibility not just of church professionals, the gifted and the talented, but of all followers of Christ. Francis Chan overcomes your fears by asking the basic questions: what is a disciple, why are we commanded to make disciples and how can I have the heart of a disciple maker? The answer he gives comes down to two simple rules: Teach what you learn from reading Multiply, and Share your life - not just your knowledge.